And so, the Israeli Bandage or Emergency Bandage was born. It goes by a few other names as well, Emergency Bandage, Trauma Wound Dressing, Hemorrhage Control Bandage, Pressure Dressing. But this is the bandage that drove the industry to where it is today. And with such great features, it’s no wonder why it’s the choice bandage for the US Military. One of the most interesting things about this bandage is that it’s wrapped twice, that’s right two wrappers. The double packaging ensures their sterility. The outer wrapper is clearly marked on the new Israelis with tear marks, but if you don’t know what you’re looking for on the interior wrapper you may waste precious time. The inner wrapper is clear and has a small pre-cut tear mark on the very top of the bandage, but both the top and bottom of the bandage’s long side look the same. You’ll have to pull on it slightly to loosen up the side with the slack (top) to find the pre-cut tear mark to open it. With the added potential of having gloves on and slippery hands, this is no time to be wildly tearing at a plastic wrapper to get to the bandage. And in this world seconds count! This is serious when you’re talking about stopping a severe hemorrhage and having to open a pressure dressing like the Israeli Bandage twice isn’t practical. So, the need for practice and educating yourself is critical. We recommend storing them out of the outer vacuum sealed wrapper (still wrapped in the inner vacuum sealed wrapper). This Emergency Bandage is really a pressure dressing. It combines a sterile dressing, elastic bandage, and pressure applicator capable of exerting up to 30 lbs. of pressure on a wound. The closure bar, which secures the bandage at the end of wrapping, can also be used to exert additional pressure. The Emergency Bandage comes with several features such as having mobile pads that remove for wound packing or placement, and a size range of either a 4-inch, 6-inch, or 8-inch abdominal pad. The Israeli bandage is a multi-purpose bandage and can be used as a make-shift tourniquet, ACE Wrap, or even a sling to immobilize an appendage. It’s truly a versatile item to include in your trauma kit or first aid kit. It can also be self-applied, even one-handed. 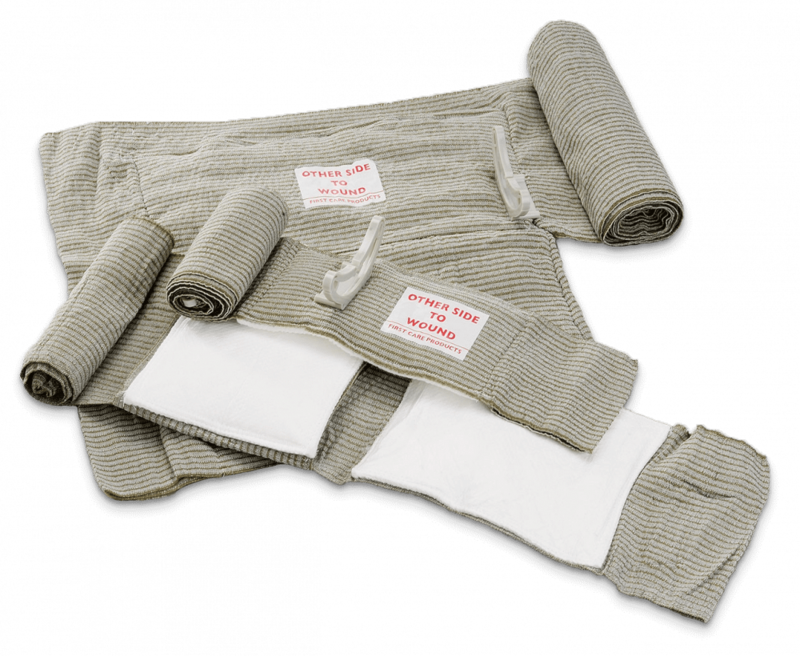 It has been the standard of care in the U.S. Military since 2004, The Emergency Bandage provides multiple applications for many possible wounds including amputations, making it ideal for the treatment of severe blood loss. There’s a reason this bandage is a number one choice for the professionals… it’s built tough and it gets the job done.